In this Short Cut, we’ll play with the contents of a college course catalog and see how we can use XML for course descriptions, tables, and other content. Underlying principles of XML structure, DTDs, and the InDesign namespace will help you develop your own XML processes. We’ll touch briefly on using InDesign to “skin” XML content, exporting as XHTML, InCopy, and the IDML package. The Advanced Topics section gives tips on using XSLT to manipulate XML in conjunction with InDesign. 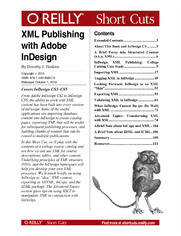 Looking Forward: InDesign as an XML "Skin"